Lights, Camera, Profits! ReviewReviewed by David Jenyns on Sep 25Rating: 4.0Lights, Camera, Profits! offers a complete solution for you to produce quality videos for your business.Looking for a way to produce quality videos for your business? If so, then it is best to check out Lights, Camera, Profits video marketing course today. This allows you to follow step by step instructions on how to come up with quality videos to promote your products and services. This is perfect for beginners as you can follow these instructions even with little technical expertise. Not only you will learn more about the technical aspect of creating videos, you will also know how to brand these videos for maximum advertising impact. Want to know more features of this cool video marketing course? Visit my complete Lights, Camera, Profits! today. *Please Note: The Lights Camera Profits Digital Membership is owned and developed by Melbourne SEO Services. This is the most comprehensive and effective course on video marketing that is available anywhere, as we use the techniques taught within ourselves with astounding results. Many of our customers and clients greatly benefited from this course as well as you’ll see from the positive testimonials we have received for this product. Gain Advantage Over Your Business Competition With The Power Of Web Videos. The system we've used to get over 1 million views on YouTube. With over 7 hours of pure meaty content, The Lights Camera Profits Digital Membership leave no stoned unturned in taking you from newbie to professional video marketer. You’ll learn effective keyword research techniques to use video to exploit the search engines, how to produce videos that people will love watching, and how to profit massively from them. Dave shares YouTube secrets to workshop participants. Your investment for the Lights Camera Profits Digital Membership is just $897, considerably cheaper than the $2000+ that live attendees paid for the workshop. Private clients pay $5000 for us to work on optimizing videos for online marketing, so you can get access to the material at just a fraction of the cost of what others have paid. The product is also backed by a 3 month guarantee policy so it is completely risk-free. Is the Video Workshop Worth It? Video is the marketing medium of the future. If you don’t take advantage of this trend today, your competitors will and hoards of prospects and customers will go into their sales funnels instead of yours. Armed with our course, you’ll be able to position yourself light years ahead of those who don’t have access to the techniques revealed inside. This is an investment that will pay for itself many times over for years to come. Click here to find out more. Want to get a taste of what the workshop have in store for you? Watch the sample clip below. Still having second thoughts? Here’s what the workshop participants thought about it. 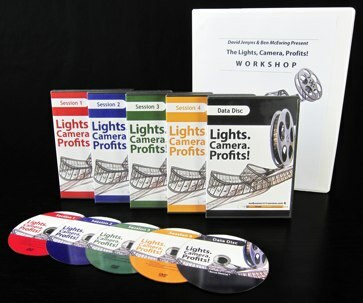 Click below to get the full details of the Lights, Camera, Profits! Digital Membership and how to purchase them.